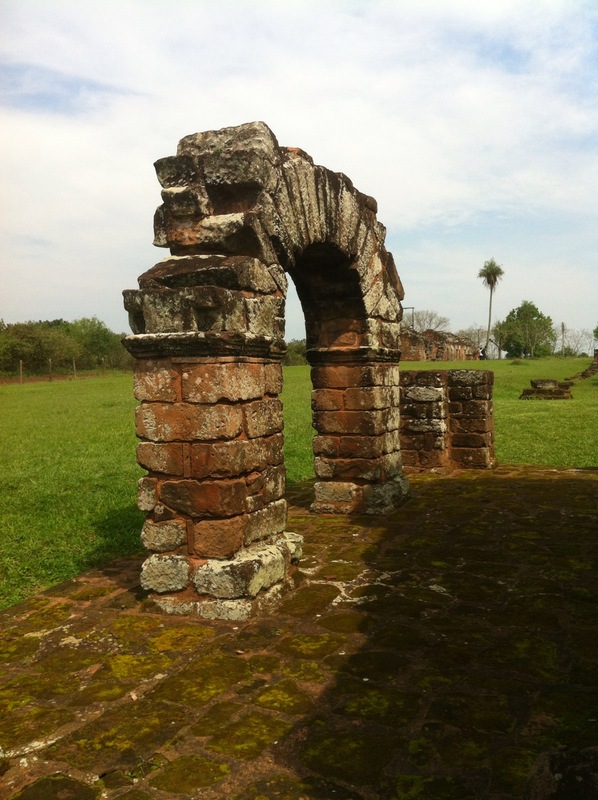 The guidebook had warned me that when you first cross the border into Ciudad del Este in Paraguay, you’ll be tempted to instantly cross back again. But, even though I was prepared for the worst, I still felt overwhelmed by the mob. People surrounded me, waving flyers in my face, offering taxis (always to the bus terminal, so I guess most people don’t stay in the city long), or making kissing noises and calling “hey, baby”. I seemed to be the only tourist, unlike the swarms in Puerto Iguazu, and I was eager to escape the attention. So I hurried along in a random direction until the crowd had died down. Realising the bus terminal was three kilometres away, I flagged down a motorbike taxi and performed a balancing act with my rucksack, day pack and the oversized helmet that bounced around on my head. 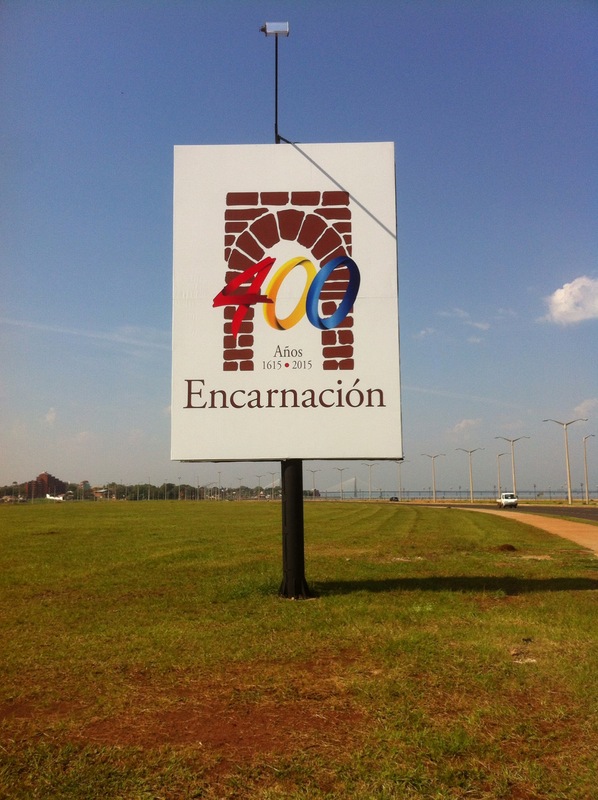 When I arrived at the bus station, a row of men started shouting the names of Paraguay’s two main cities, Asunción and Encarnación. I opted for Encarnación, and settled in for the six hour bus ride. I stayed in an almost empty hotel opposite the bus terminal, and, in the morning, headed across the road to catch a bus to the Jesuit ruins in the nearby town of Trinidad. The terminal was chaotic, with people trying to flag me down and sell me tickets, each claiming theirs was the bus that went first. I tried to determine who was lying, and whether or not I was being ripped off by the the guy I was handing money to in exchange for a ticket, all the while shaking my head at vendors who were holding racks of sunglasses or trays of food in front of my face. Even when I got onto the bus, people continued walking up and down the aisles to sell their goods, or standing at the front of the bus to give a demonstration of their product. I got off the bus when the driver said to, and followed a trail through a charming village of stone houses, stopping every now and then to ask someone if I was going the right way. Eventually I came to a ticket office, paid my entry, and walked through a gate in a high stone wall to get to the ruins. I’m rarely interested in history, but I love ruins. Clambering over rocks while imagining the people who once lived there is something I’ve always enjoyed. And these did not disappoint. 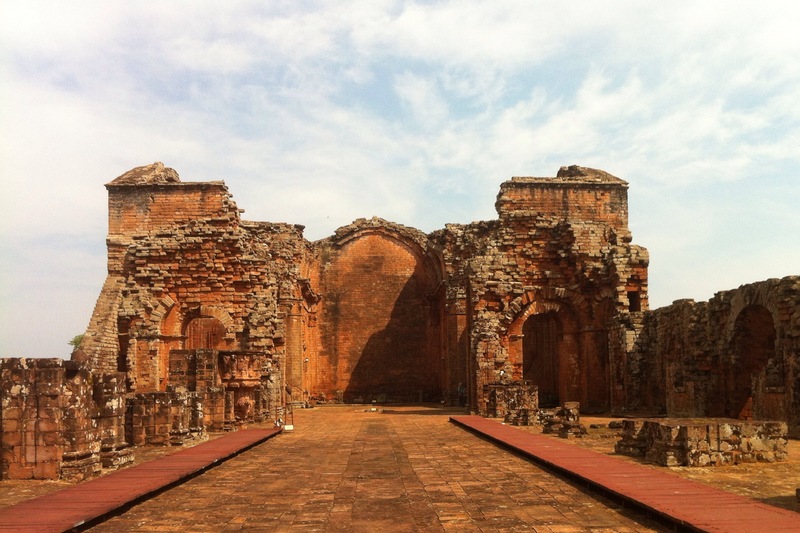 Officially called La Santisma Trinidad de Panamá, the ruins consisted of a central church, surrounding buildings, guard tower and what appeared to be a graveyard. 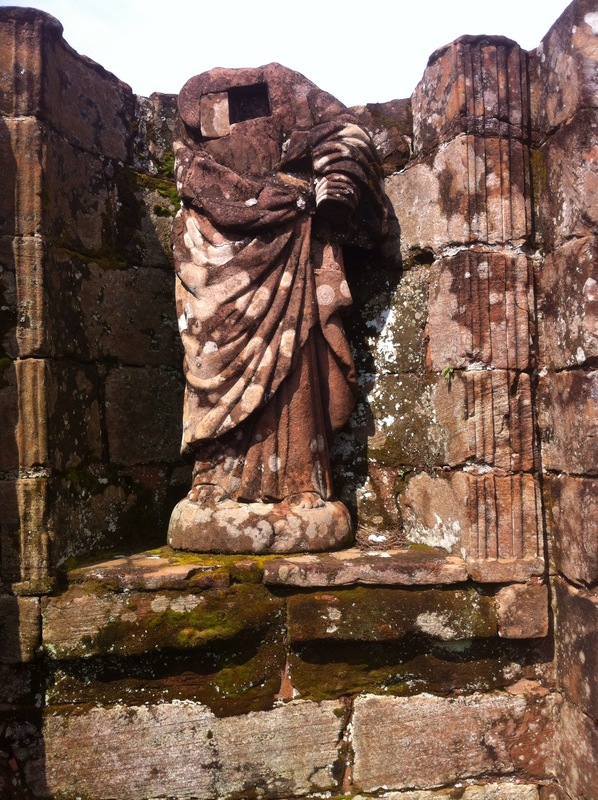 Scattered throughout were remains of pottery and religious statues, which had been decapitated when the Jesuits were forced to leave. The settlement was built in 1706 by Jesuit missionaries, as a self contained community outside of Spanish colonies. This information is brought to you by Wikipedia, as the site itself provided no information. I escaped from the overpowering heat back to my hotel, and later that evening went out in search of food. The streets were dark and deserted, and I walked for several blocks before coming to an open restaurant. It was worth it though, as there I finally managed to escape the pasta-pizza-empanada cycle and treat myself to sushi. 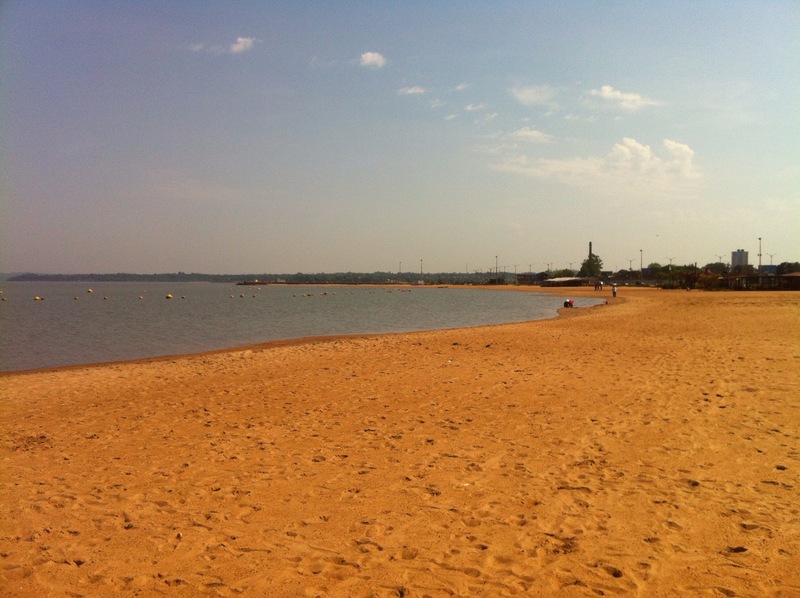 The following morning, before I needed to catch my bus across the border, I took a stroll down to the beach on the river. I expecting a small, artificial strip of sand, and was surprised to find an open green plaza and sunny yellow beach with clear blue water. 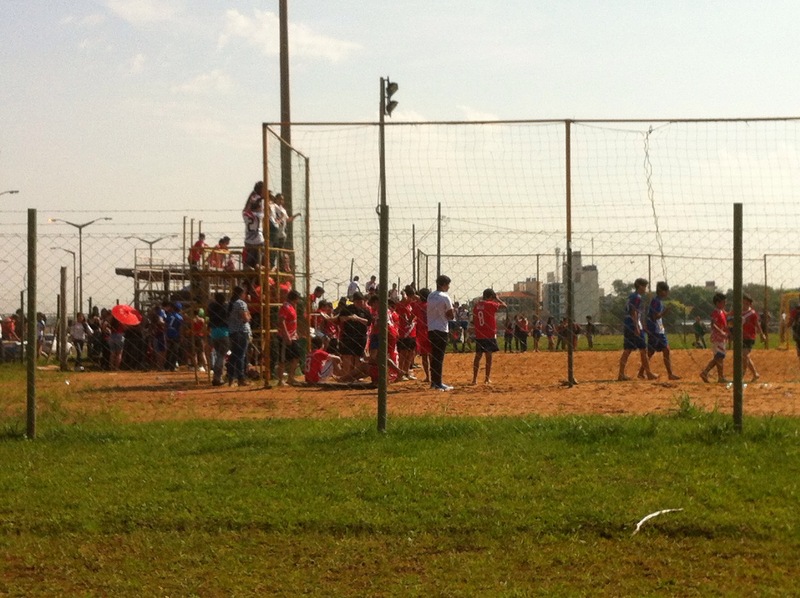 Children were playing a football match on the plaza, while teenagers kicked a ball around on the sand. As usual, I felt like I was leaving too early. Paraguay was intriguing, so near the typical backpacker circuits, yet so unlike anywhere else I’d been in South America. In fact, it felt almost African, the bustle of the bus station, the amazing sights devoid of tourists, and also, on a negative note, the bribe-seeking and rip-offs. I was keen to see more, to make my way to the off-the-beaten-track parks and lakes, to take a boat up the river to the impenetrable Chaco, or even to just take a bus to the capital city of Asunción. But, as always, time was pressing on (four months seems like a long time until you realise how much you want to do and see here). So I said goodbye to Paraguay, crossed the border back into Argentina, and took an overnight bus up the mountains to Salta. Thanks Eileen, great to get some feedback. Glad you’re enjoying the posts, loads more to come! Sitting on the train to Dublin reading your blog , and i am so envious of you ……. Its brilliant for the want- a- be traveler being able to follow your travels.